Coaxial cabling was used for 10BASE2 and 10BASE5 Ethernet in years past. 10BASE5 was referred to as thicknet, and 10BASE2 was referred to as thinnet because 10BASE5 used thicker coaxial cable. Even 10 years ago, newly installed Ethernet networks most often were not 10BASE2 or 10BASE5 networks, but rather were 10BASE-T. I personally have not seen a 10BASE2 or 10BASE5 Ethernet NIC available for sale from a vendor for at least 5 years. So, the relative importance of remembering the details of coaxial cabling for your job is pretty small. Coaxial cables are shielded. They have a single copper wire in the center, with plastic insulation and copper shielding surrounding the copper wire. For 10BASE5, the network consisted of a length of coaxial cable of up to 500 m in length. In fact, the "5" in 10BASE5 represents the maximum length of a single cable segment. To connect to the segment, a vampire tap was used. The vampire tap is a piece of metal in the shape of a cylinder when closed. By closing the tap around the cable, the tap actually pushed through the shielding to let the metal in the vampire tap touch the copper wire inside the cable. I'm sure it is now obvious where the name vampire tap came from! 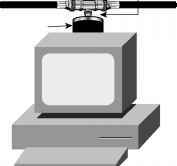 From the vampire tap, a short cable, called an Attachment Unit Interface (AUI) cable, connected the tap to the Ethernet card on the PC. Running individual shielded, heavy, relatively inflexible coaxial cable for 500 m for a long 10BASE5 network was, to say the least, a lot of work. For 10BASE2, which was developed after 10BASE5, instead of a single length of cable, the bus was created by a series of cables. 10BASE2 used thinner, more flexible coax cabling as well. The cables used a British Naval Connector (BNC) connector, which was a lot easier to work with than the vampire taps. To connect a computer, a T-connector was used, with one end plugged into the Ethernet card, another into a cable from the upstream cable, and another cable connecting to the next device downstream. Figure 11-8 shows a picture of the BNC connector, and Figure 11-9 shows the typical cabling options for 10BASE2 and 10BASE5. 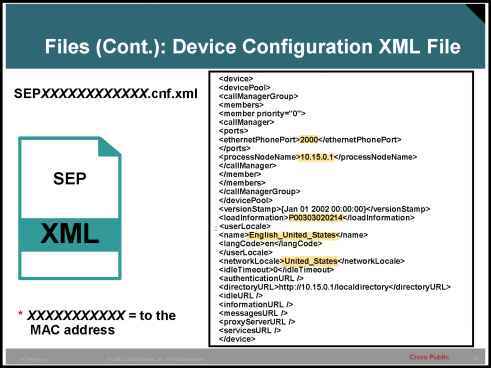 The one component shown in Figure 11-9 that was not already discussed is the term transceiver. 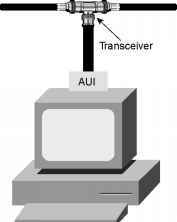 This term was created by melding the terms transmitter and receiver. Instead of having the Ethernet card itself include the electronics that sent and received the signal on the Ethernet cable, the original Ethernet designs used an external device to actually encode the bits. The concept is not terribly different from having an external CSU/DSU on a WAN circuit, as covered in Chapter 4, "Fundamentals of WANs." For the purposes of networking, coaxial cable has some advantages. It allows for longer network segments—500 m, with longer distances allowed using repeaters. However, the cons of coaxial cabling include the fact that it is more expensive, heavier, larger (takes up more room in conduits), and relatively inflexible. Also, when used for Ethernet, a single break in the cable takes down the entire Ethernet segment! All of these factors add up to some of the reasons that coaxial cabling is not a popular option for network cabling today.